Information about Weddings, Bridal Fashion, Wedding Day Beauty Tips, Summer Wedding Fashion ideas and more. Here we are again, halfway through another year. If you have been planning a wedding the past few months, the time has probably flown even faster than ever. The cake, the rings, the honeymoon, and the dress (which of course has to be absolutely perfect) have to be decided upon. The bridal collections this year offer a fresh and exciting array of new styles to choose from. Two-piece dresses are maintaining their popularity. Not only are they flattering to a variety of figures, but they alter easily as well. Bridal shows for Fall 2001 also display an abundance of dresses with what is referred to as "architectural details". These consist of asymmetrical hems on skirts and tops, tank style bodices with one shoulder left completely bare, and fabric overlays draped and secured to one side among other stylings. This makes for a very striking dress which calls for little in the way of other embellishments. For the more traditional bride the classics never go out of fashion. A-line and sheath dresses are still popular and are best when trimmed with couture-like details such as embroidery or beading. For added interest some trims are colored. An ivory dress with gold embroidery along the cuffs and hemline is simply stunning. There is also a renewed interest in trains. Remember, the back of the dress is the part which is seen during the ceremony. Make sure that the train can be either pulled-up (bustled) or removed altogether for the reception. Going into late fall and winter, fur is making a comeback. Last popular during the 1950's, it is popping up in both real and fake varieties on cuffs, hems, bodices, and on handbags. It adds a very formal element to the look so make sure the style of the rest of the ceremony carries through with the theme as well. Trends come and go but one rule always holds, especially with you wedding gown: be true to your own style and personality.Find a dress that is a direct reflection of you and that looks beautiful on you. If ruffles from head to toe is what you always dreamed of wearing and nothing else will do, then go for it. Just please leave the goose dress to Bjork. Foundation — Foundation is the key to keeping makeup looking fresh. Consider your face to be the painter's canvas. A nice smooth base is essential before applying the other layers. Experts suggest using a slightly heavier foundation than usual. Mascara — Mascara is essential to bring out your eyes. Try using an eyelash curler before applying mascara to bring out your lashes and to make your eyes look bigger. Since tears may be part of the day, waterproof mascara is a must. Blush — Blush should be natural looking. Choose colors that complement your skin tone and blend well. Remember the goal is for your family and friends to notice you - not your makeup. Lipstick — Keeping your lips consistent with the rest of your makeup is important. However, since lips tend to fade away in photographs, using a shade or two darker than you would ordinarily wear is appropriate. Also, to ensure that it lasts, use a lip liner and apply lipstick with a lip brush. Finish lips by blotting them lightly with powder, then apply another coat of lipstick. Concealer — Concealer should be used where necessary. Don't forget to apply powder and blush on skin exposed by low necklines. Never match your makeup to your clothing, handbag, jewelry or any other accessory. Treat yourself to a makeup lesson. Everyone can benefit from expert advice. Avoid waxing and facials right before the wedding. Give your face five days off before the big event. Last, but not least, don't experiment with a new look on your wedding day. If you've never worn fire engine red lipstick, don't try it now. Your makeup should look natural and reflect your personal style. Stick to a classic look. Avoiding trends will make you look timeless. You found the perfect guy, and the perfect gown, now you need the perfect accessories! As a general rule, the more elaborate the gown the more simple your accessories should be. The trend right now in accessories is intricate but dainty. Handbags are adorned with beading and embroidery but are tiny in size. Necklaces are woven of a variety of beads, but yet the beads are small and delicate. The one thing that looks dated right now is large and garish rhinestone jewelry. Classic pearls are always appropriate, especially with a classical-styled gown (think Jackie O.). A beautiful diamond solitaire pendant that rests in the hollow of the collarbones looks elegant as well. Quantity of accessories is also important. Earrings, necklace, bracelet, and watch are often too much. Lose one of them. How will all your accessories look in a photograph? 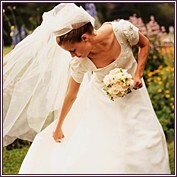 You may also want to ask your mother or grandmother for sentimental pieces to borrow for your special day. I wore my grandmother's watch that was given to her on her wedding day...something old and something borrowed. The watch actually still worked fine, and on such an emotional day it gave me a sense of connection to past generations. As for ankle bracelets and toe rings, if they are truly your style and you regularly wear them, then go for it. It's your day and it is you that will be looking at your pictures the most afterwards. If one word had to be used to describe bridal fashions for this summer it would be BARE. From strapless or tank-style bodices to tiny spaghetti straps, bare is definitely in. Many brides may balk at the thought of showing off their upper arms...for you there is the off-the-shoulder gown with short or three-quarter sleeves. This style is particularly beautiful on the bride with a fuller figure. If you don't want to go completely bare but like the look of the necklines, you can find gowns that have a sheer lace or mesh overlay that covers the upper chest and arms. Fabrics for summer gowns are light and airy.Whether you are planning an outdoor wedding in the midst of August heat or an indoor affair that will be completely air conditioned, you will still want a dress that says "summer". Nothing would ruin wedding pictures more than perspiration stains on all of the dresses! Layers of chiffon or a lightweight silk are appropriate, as well just about any lightweight fabric. Finding a dress that is lined in cotton is another good idea as it is a bit cooler against the skin than pure silk. Bridesmaids can take a cue from your gowns style and fabric weight also.